Nothing spreads Christmas cheer like a good old fashioned Christmas card! Postboxes up and down the country will be heaving with festive post this December, but it's easy to make your cards stand out! 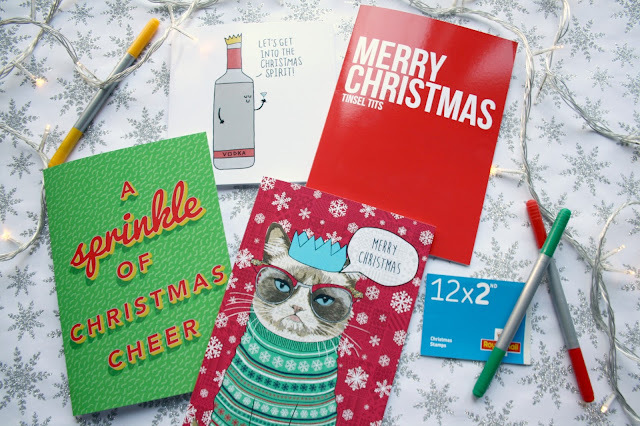 I was recently contacted by the lovely people at Choosey.com* who offered me the chance to try out their greetings card service, and I couldn't say no! Anyone who follows me on Twitter knows how much I love sending and receiving snail mail, so this was the perfect opportunity for me! The perfect recipients of my cards were naturally my fellow bloggers! Choosey's website allowed me to easily pick out the cards that I wanted from an enormous selection, and I found the ideal card for each of my blogging friends! On Choosey's handy card finder engine, you can select from loads of categories, including funny cards, cute cards, rude cards, and animal cards - to name but a few. You can also narrow down the selections further, browsing cards suitable for mum or dad, an auntie or uncle, and a boyfriend / girlfriend. This made the process really fast and simple. So, let's get into the cards that I picked out! I went for a selection of funny, cute, and text cards which show off the diversity of Choosey's offerings. All of the cards are large (most are A5, the square one at the top left is slightly smaller) and they definitely stand out on the mantelpiece amongst all the others! The cards are super glossy and the print and paper quality is very high. Choosey give you the option of having the cards sent to you, along with another envelope for the recipient, but they will also mail out the card to the recipient on your behalf, using first class post. I tried out both options, having half of my cards delivered to me, and the other half mailed directly to my blogging chums. The Choosey postal service was super fast and everything was delivered the next day - very impressive! Now let's look inside! Once you've selected your ideal card on the Choosey website, you can start to customise the interior and make it your own! 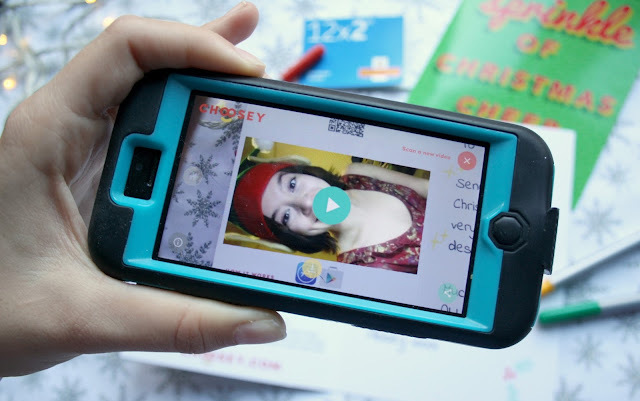 One of my favourite features that Choosey offer is their video card service - you can record your own video using their app and have a code printed inside the card for your recipient. When they open it, they can scan the code using their phone and your little message starts to play! I absolutely loved this feature, it's a fantastic addition to a card - especially for a friend or relative who you might not get to see as much as you'd like! As well as the video, you can also type in the message that you'd like to appear inside the card. There's a big selection of fonts to choose from! 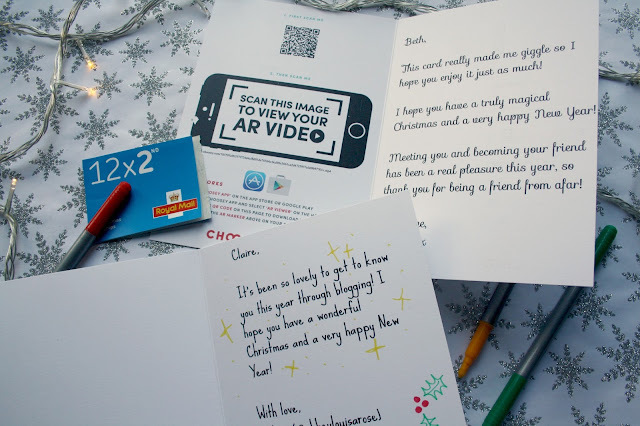 What you put inside the card is entirely up to you - if you'd prefer not to record a video, that's fine too, and you can even leave the card blank inside and write in a message by hand. I used some coloured pens to jazz up the inside of my cards with some Christmassy doodles. The price of these cards is also very reasonable. Each one costs £2.99 for a standard A5 card. 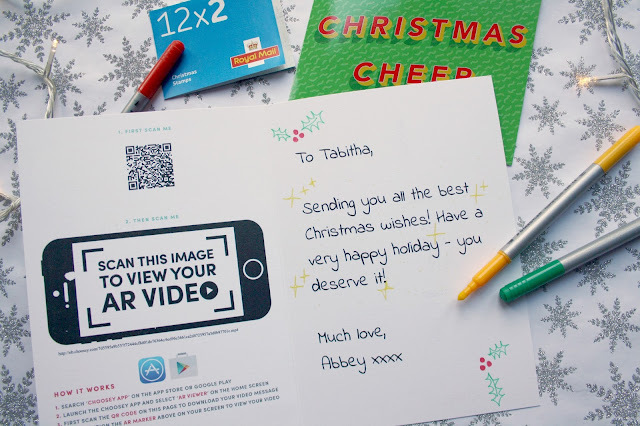 To add a video message costs an extra £1 and first class postage is £0.99. For a price that's very similar to what you would pay for a regular card on the high street, you get so much more when buying with Choosey! The cards went down an absolute treat with my blogging friends! My only complaint about the Choosey service is that some of the printing on the inside of the cards left a little to be desired. Some of the text had smudged on the inside, leaving unsightly black marks, but these were easily covered with my colourful doodles and didn't detract from how much I liked the cards! 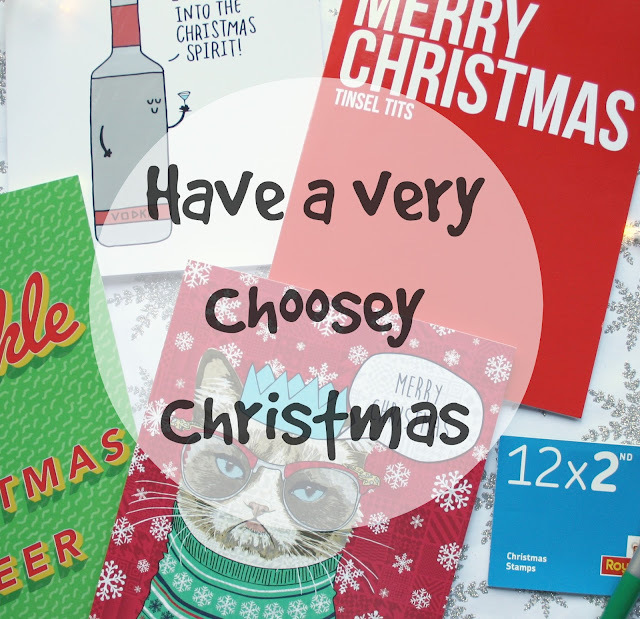 I would still definitely recommend that you check out Choosey.com if you haven't bought your Christmas cards yet! You can also use my discount code: BGCHRISTMAS16 to get 25% off your order with Choosey! They are also offering you the chance to win ten cards to send out this Christmas so if you'd like to enter the giveaway, just fill in the widget below! Good luck! Are you feeling in the festive spirit yet? Have you sent out your Christmas cards? Let me know in the comments!